Every day someone comes into the office concerned about a bump on their foot. It may or may not be painful. It could be small enough to be on one of the toes or quite large on the top or bottom of the foot. It could be perfectly round or an irregular shape. It could be a normal color or darker. It could have been present for a week or a year. It could be soft or hard. Don't ignore that bump! Most bumps whether soft or hard aren't serious. However, occasionally a bump can be cancerous. Some bumps on the foot require immediate attention in the form of removal. This can be done in the office in some cases but often it requires an outpatient procedure. Other bumps can be treated with a Cortisone injection to dissolve them. And, even other bumps can be ignored if they're not painful. Some bumps need to be addressed quickly because they are constantly irritated by shoes. A bump on the back of the heel is one such bump that shoes can irritate. We will always recommend wearing alternative shoes, however, that doesn't always eliminate the pain. In some cases we will take a piece of the bump and send it to a pathology lab to be evaluated. Of course, in this situation we are looking for cancer cells. If any are present we will remove the bump immediately. Any bump that is getting larger and more painful requires immediate medical attention. It could start pressing on a nerve, causing an even greater amount of pain. Many people try over-the-counter products for foot conditions. A bump on the foot is not a time for that. And I'm not aware of any products that effectively eliminate bumps. The bottom line is… Don't ignore that bump! Most bumps are easy to diagnose with an exam, x-ray and ultrasound. They are also easy to treat and can be eliminated quickly when indicated. If you have a bump on your foot, instead of worrying about it, come in and have it checked out. Eliminating the hurt that a bump may cause is one thing but having peace of mind of knowing what it is, is another. Do you need to treat black toenails? Whether or not your black toenails need treatment largely depends on why they are black, and whether or not they are painful. Nails that are black because of a type of fungus or some melanoma underneath the hard keratin will definitely need treatment. If your nails are dark because you’ve bruised them—whether by running, stubbing a toe, or dropping something heavy on your foot—you might not need extra care. Bruised nails are dark because small amounts of blood leak under your keratin and stain it black. The discoloration will grow out as your nail does. Too much blood pooled under the nail, however, can cause painful pressure. This does need treatment to alleviate your discomfort. Dr. Darren Silvester and our team at Next Step Foot & Ankle Clinic can help with this by draining the pooled blood, or even by removing the damaged nail. Don’t wait until you can’t stand it anymore to get help. Call our Pleasanton, TX, office at (830) 569-3338 to get an appointment. How can I treat heel fissures at home? Soak your feet in lukewarm water for about 15 to 20 minutes. Then, use a pumice stone to gently remove the dead skin. Gently pat your skin dry, followed by an application of moisturizer, and a thick pair of socks. We recommend 40% or greater urea creams for fissures. Stop by our office and pick up some RevitaDerm or Kera 42. After your shower, apply the cream and wrap your feet with saran wrap. Top with a pair socks if you want, and leave the cream on for 20-30 minutes. Remove the saran wrap and your feet will feel and look super soft! With these easy, at-home cures, your feet will be feeling brand new in no time! If you don't notice improvement after a week, contact Dr. Darren Silvester at Next Step Foot and Ankle Clinic in Pleasanton, TX. Call (830) 569-3338 or by visiting us online. What are the symptoms of skin cancer on my feet? Checking your feet for skin changes is a key part of identifying malignant lesions before they cause too much damage. There are a variety of symptoms to be wary of—particularly for melanoma. Small, scaly bumps or plaques, particularly if they crack and bleed or have a callus over them, may be squamous cell carcinoma. White, pearly patches or bumps that ooze may signal basal cell carcinoma. Malignant melanoma, the rarest and most deadly of the skin cancers on the feet, has many possible symptoms that fit into an “ABCD” pattern. These letters stand for asymmetry, borders, colors, and diameter. 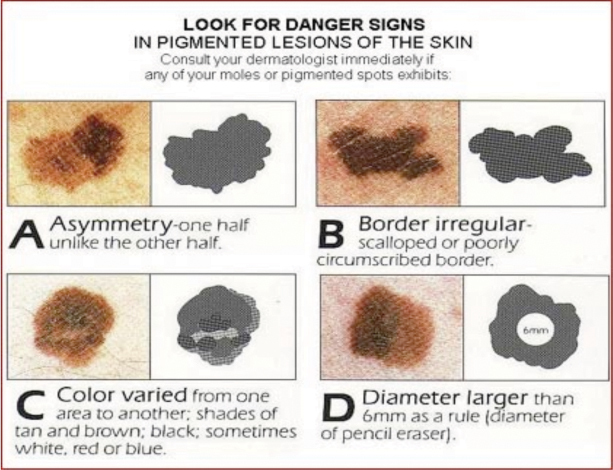 Malignant melanoma usually has an asymmetrical shape; is surrounded by irregular or uneven borders, displays multiple color splotches; or has a diameter greater than six millimeters. If you think you notice cancer on either of your feet, contact Dr. Darren Silvester and our team at Next Step Foot & Ankle Clinic in Universal City or Pleasanton, TX, to take care of it right away. You can reach us for an appointment by calling 210.375.3318 or by using the online request form.